The concept of Earth-2 was introduced in "The Flash of Two Worlds" (Flash #123, 1960). In this story, the Silver Age Flash (Barry Allen) met the original Golden Age Flash (Jay Garrick) for the first time. In order to explain why this meeting had never taken place before, it was surmised that the original Golden Age Flash actually lived on a parallel world - named "Earth-2". Eventually, this world became home to all of DC's Golden Age versions of their superheroes: Superman, Batman, Wonder Woman, etc. Since these heroes had been operating since the 1930s and 1940s, they were now much older than their Silver Age ("Earth-1") counterparts. The "Earth-2 Superman" first appeared in Justice League of America #73 (1966) and was introduced as continuing the adventures of the Golden Age Superman into (what was then) the present. His powers and costume were based on the powers and costume that Superman had in the early 1940s, while his career as both Clark Kent and as Superman was extrapolated from what it was around the time of 1939. Clark Kent was a reporter for the Daily Star (rather than the Daily Planet) and Superman and his father had the original forms of their names: "Kal-L" and "Jor-L" (rather than the later Kal-El and Jor-El). Similarly, his adoptive mother was given the name Mary Kent rather than the later Martha Kent. 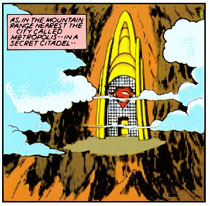 Like his Golden Age counterpart, the Earth-2 Superman has a secret mountain citadel, rather than the Earth-1 Superman's Fortress of Solitude. Since this Superman was supposed to have been the "original" Superman as first seen in 1938, by 1966 he was in his late 50s, with the accompanying career and life changes that come with maturity. This was presented as a yet-unseen, newly constructed back-story. Foremost among these changes was his marriage to Lois Lane, which had happened sometime in the 1950s after he revealed his secret identity to her. Another change was Clark Kent's having been promoted from senior reporter to Editor-in-Chief of the Daily Star. When George Taylor retired from the office of Editor-In-Chief, Kent was promoted to that post over Perry White (Superman Family #197). Over time, Superman began to experience a bit of melancholy that he alone was the sole survivor of a dead world. In the 1970s, a spaceship arrived from the planet Krypton, sent by his uncle Zor-L. 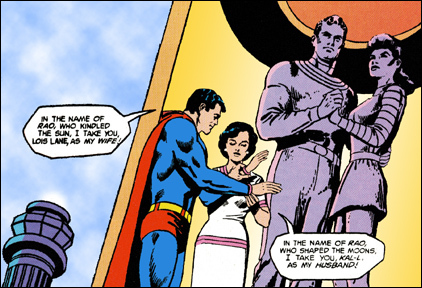 The ship contained his cousin, Kara, who had taken a longer route to Earth but had matured more slowly, being only 20 years old when she arrived on Earth (revealed in Showcase #97). Superman trained Kara in the use of her abilities and she eventually took on a super-powered role of her own as Power Girl (All-Star Comics #58), thereby becoming the Earth-2 equivalent of Supergirl. Superman went into a bit of semi-retirement after Power Girl's arrival on the scene, but he continued to be active when needed with the Justice Society. In 1981, in a story by Gerry Conway, George Pérez, and Romeo Tanghal, Superman returned to full-time activity. Justice League of America #195-197 presented a monumental epic involving the Ultra-Humanite, the Justice League of America, and the Justice Society which resulted in the formation of a new super-team composed of a younger generation of heroes, many of whom were related to the original JSA members (Infinity Inc. #3-10). Like the Golden Age Superman, the Earth-2 Superman's powers are the result of his Kryptonian birth, his "flight" ability being limited to very long leaps. Bruce Bachand's Tribute to the Earth-2 Superman! Return to Superman in His Comics!